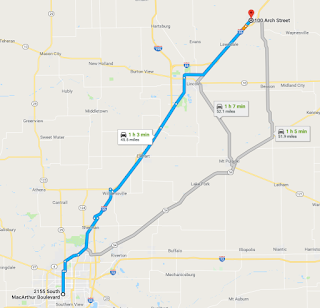 Assuming Day 1 has gone as according to the plan laid out in the prior blog entry, I should be in Litchfield, IL on the morning of Day 2 with a full charge courtesy of Victory Lane Ford and/or Level 1 (120 V) charging from whatever hotel I select. On a normal road trip, I tend to check out of the hotel, refill my coffee cup and hop on the highway. In this case, range and speed efficiency is everything. Therefore, I'll stick to back roads where I can travel 45-50 MPH. Along many Interstate highways including I-70 and I-55, there are often access roads that run parallel to the highway but mostly travel the same path. These are perfect for my purposes. One caveat is that they sometimes stop abruptly or veer away from the highway due to terrain or lack of maintenance. An example is if the main highway goes across a river, the access road often does not have a separate bridge. 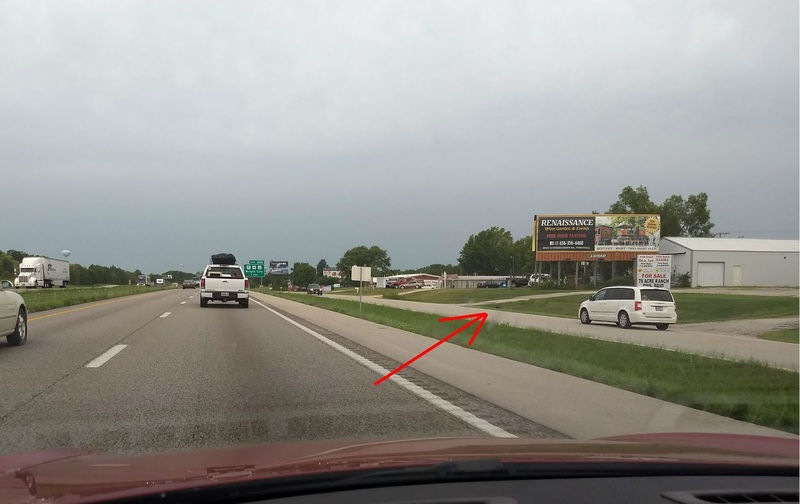 So it pays to look ahead and be ready to hop on the highway briefly to avoid going miles out of the way, thereby killing any advantage of time efficiency. Geek alert: If you're not interested in calculation details, please skip to the next section. I had mentioned the optimum speed of 45-55 MPH on a social media post thereby prompting question of how I arrived at this range. 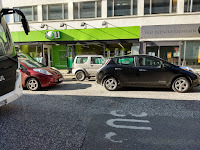 Based on the LEAF's energy efficiency vs. speed and the Level 2 recharging rate of 6.6 KW (30A) which is typical for public Level 2 chargers, one can calculate the drive time and energy used for a given distance and the time required to recharge that amount of energy. At lower speeds, the drive time is controlling whereas at higher speeds, the charge time is controlling. If you add the drive time and charge time, for each speed, an optimum becomes apparent in the 45 - 55 MPH range. For more details, see this Google Sheet. I should point out that this calculation becomes moot when there is access to a DCQC since charging speed is vastly faster. 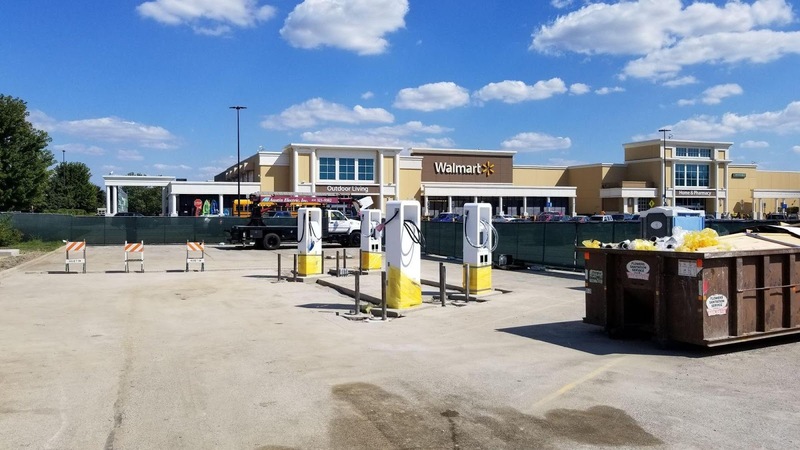 Springfield, IL is one of the locations slated to received a DCQC as part of the Electrify America initiative that sprung out of the Volkswagen TDi scandal. Unfortunately for me, the EA location for Springfield is not yet completed, meaning that instead of spending 20-30 minutes at a Walmart (PlugShare link) pit stop, I'll be spending 3 hours at a Level 2 charger at a Hy-Vee grocery store. On the bright side, I know Hy-Vee well from Kansas City and there are worse places to spend a few hours with a coffee and free WiFi. The second leg of today's trip will take me to Atlanta, IL. 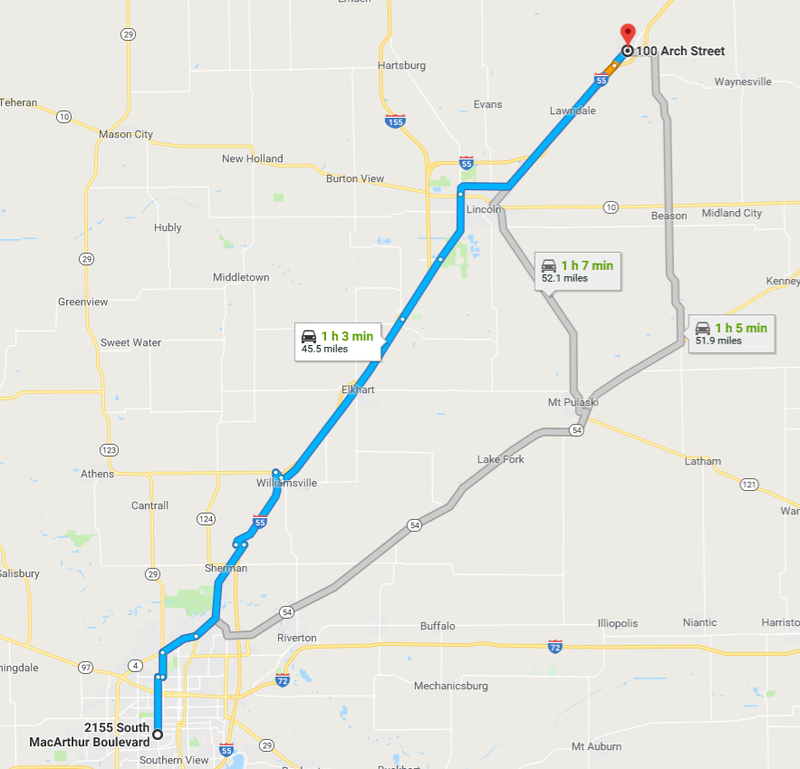 The route from Springfield to Atlanta has two options: One is along Historic Route 66 (blue on the map) and the other is on Illinois route 54 and some paved country roads (the outer grey route on the map) with only 7 additional miles relative to the Route 66 path. During my recent pass through here, some sections of Route 66 were under construction, so I may need to play it by ear when I arrive there. 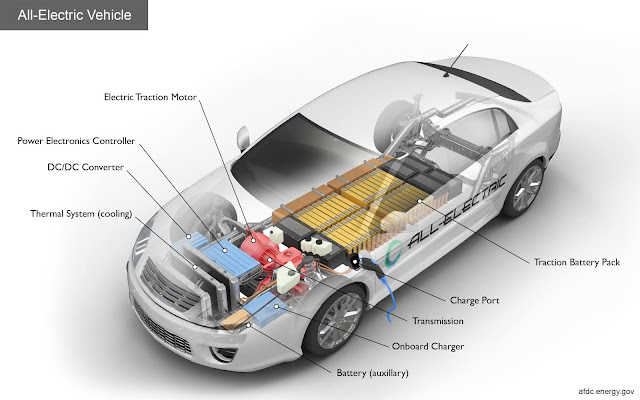 In any case, both are less than 55 miles and well within the range of the LEAF. I had a chance to stop by the Atlanta charging location during a recent trip along the same route, and it's really just a small parking lot with some electric outlets including a J1772 Level 2 plug, some NEMA 14-50 and 14-30 receptacles. Having put my own eyes on this one and with a perfect 10 rating on PlugShare, I'm relying on this one to keep me going. With only another 25 miles to the next stop of Bloomington, IL, I hope not to need a long stop at this location. Normal, Illinois that is. 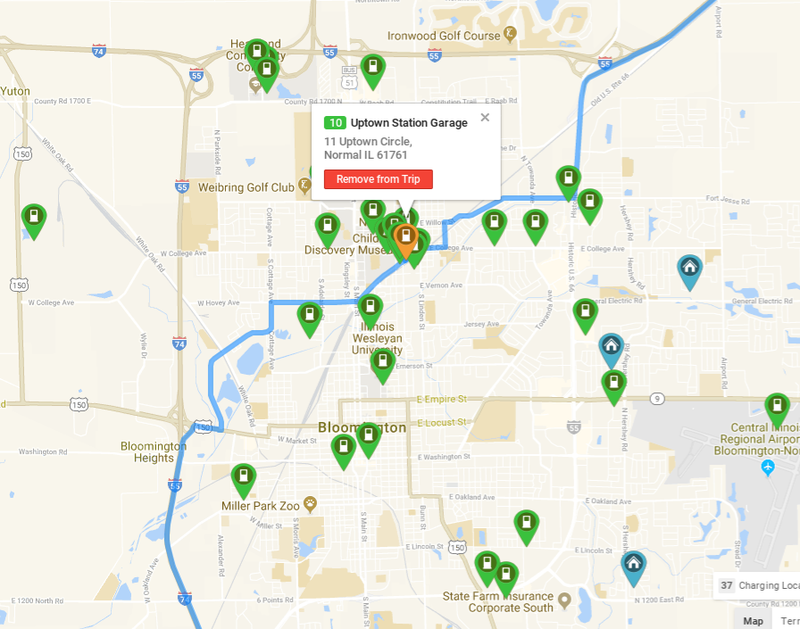 The sister city to Bloomington sports one of the few DC Quick Chargers (orange pin on the map) along the way which happens to be collocated with a Tesla Supercharger in a parking structure. 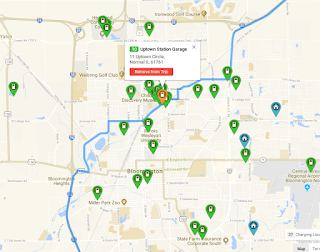 Although the Bloomington-Normal area is fairly saturated with Level 2 chargers (green pins), it's the DCQC that I hope will be available, thereby cutting several hours from my trip. With songwriter Bobby Troup and singer Nat King Cole (Wikipedia link) in mind, the next part of the trip will be along the "Mother Road". While there are many attractions along Route 66 in Illinois, I plan to keep rolling until I reach Ambler's Texaco (TripAdvisor link), aka the Route 66 Visitor Center in Dwight, IL to use its ChargePoint station (PlugShare link). This will be one of the few actual stops at an attraction on this trip, so I plan to make the most of it. From a practical standpoint, the PlugShare entry indicates that the EV charging station sometimes get ICEd (i.e. blocked by an Internal Combustion Engine) vehicles. If needed, my J1772 extension cord will come to the rescue. 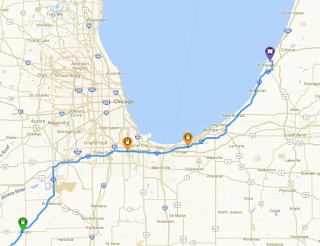 The last stop will place me in striking distance of the Chicagoland outskirts and 67 miles from an EVGo DC Quick Charger at the Lincoln Oasis rest area (orange pin on left) along Interstate tollway that runs along the base of Lake Michigan. This in turn is only 28 miles from a DC Quick Charger (orange pin on right) at a Bob Rohrman Nissan, both with a PlugShare 10 rating. One has to be careful of opening hours for car dealer chargers. This one appears to be accessible after hours based on the PlugShare photos. If not, I may need to be flexible and seek an alternate Level 2 charger to make the 83 mile trek from the rest area to my intended final daily stop of Benton Harbor, Michigan. I plan to seek out a Best Western hotel with a Level 2 charger (PlugShare link) so I start the final day with a full battery. For the total travel distance of 326 miles, this sums to a drive time of about 5-1/2 hours and a charge time of 9 hours. The 3 to 1 ratio from the previous day has turned into 2 to 1 thanks to the availability of DCQC stations. With more of these available in the future and just a bit more range, this trip would suddenly become much different in terms of timing. 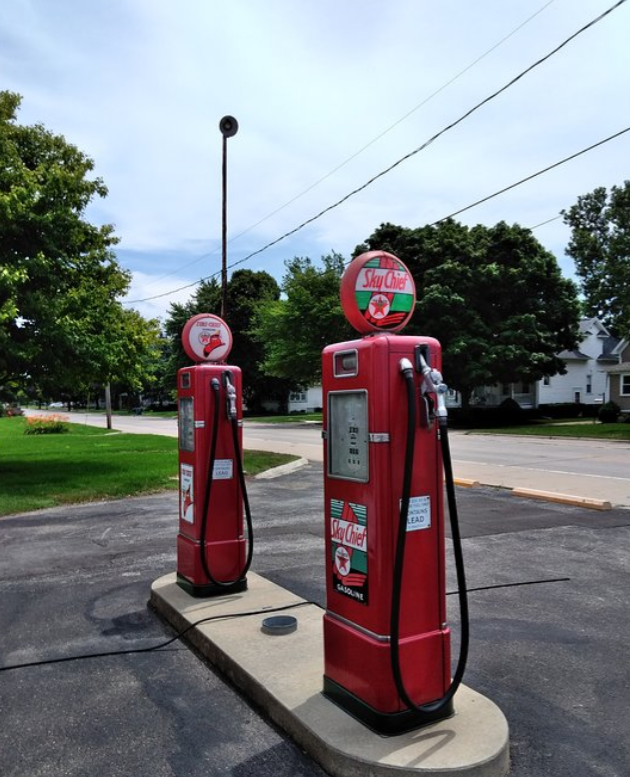 In the next episode, I will discuss the plans for the final Day of the trip, which I really just expect to be short jaunt along the Lake Michigan lake shore with a stop in the familiar and EV progressive town of Holland.